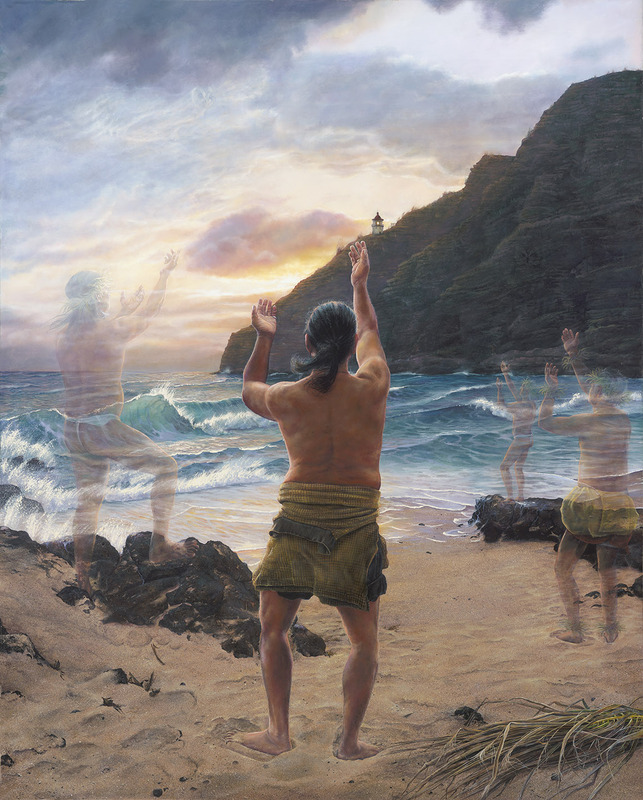 The second from the series, Ke Au Hou, celebrates kane kahiko. The physical setting is Makapu‘u Point. A man has gone down to the beach to watch the sun come up. In response to the beauty of first light, he lifts his hands in an ancient chant, the right hand higher than the left. Although physically alone and although he cannot actually see them, he is aware of the influence from the past. Past and present together pay tribute to the Creator and the surrounding radiance. i ka hikina, aia ka lā, e ala e! in the east, there is the sun, awaken. I saw this painting complete in a dream and, because I didn’t totally understand what it meant, didn’t paint it until about two years after the dream. I always tell people that I don’t paint “ghosts” but rather the influence of the past on the present. We are but the mere conduits for a culture; the culture is passed on through the teaching and influence of those who were here before we were.